Today was water truck day, and we made three different stops in Cite Soleil. We started off at District 17 near Hope School, and as we pulled up at least 20 kids ran up to the Tap-Tap chanting “Hey you!” They’ve learned that phrase in English, and they know that we will respond to them when they say it. They we were SO excited to see us and we were excited to see them too! As we got off the Tap-Tap, they jumped into our arms. Many kids in Cite Soleil are restavek children (a form of modern-day child slavery that persists in Haiti) and don’t necessarily get the love and affection they so crave. One of the most fulfilling parts of water truck day, aside from providing clean water to those who would otherwise not have access to it, is providing love and fun to kids that desperately need it. The water truck holds around 500 gallons of water. Mostly children with some women gathered in a line with their buckets. It’s interesting to look around and observe men simply watching the women and children maneuver the streets with these heavy buckets of water. Some of us held the children, some carried buckets and some worked the water hose. Many of did all three, sometimes at the same time which was a fun challenge. The buckets the Haitians brought were various shapes in sizes. Some were shaped like gas cans, some were five gallon buckets and some were even shaped like kiddie pools. While the water trucks were re-filling between the first and second stop, we toured Hope School and Church. Hope Church and Hope School were built on 40 feet of trash! Everyday 300 children go to Hope School who normally wouldn’t get an education. Healing Haiti is also building a clinic that will open by the end of this year. The kids also have access to technology via storage pods that were brought in from Minnesota and stocked with iPads, drones, and even robotics equipment. Some kids are afraid of the technology and some are so blown away by it that they’ve tried breaking iPads open to see how they work! It’s so cool to see what has been done with what was formally a landfill. Another stop we made while the water truck refilled between the second and third stop was Fleri Farm in Cite Soliel. Here they are growing crops such as plantains (can you believe that plantain trees only produce fruit one time and then they have to be cut down and new ones planted?! ), papayas, sugar cane and even some pesto and citronella. Their goal is to develop farming strategy for the area so that they can share that with their Haitian neighbors in order to increase their growing potential, thus helping them boost the Haitian economy. Fleri Farm’s long-term goal is to be able to produce dried fruits and products that can be sold in other countries to generate income that will be solely invested back into the Haitian economy. Our tour guide said there is even talk about making a variation of sherbet someday to be sold in Haiti. Our last water truck stop was near the ocean and there was a large pier that jutted out into the water. 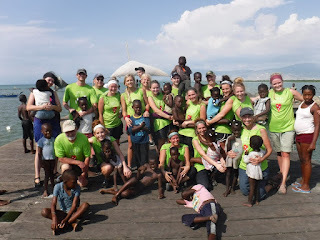 After we helped the Haitian children and women carry their water, we all went out to the pier. Lots of kids walked along with us and wanted to be carried by us. People were lining the pier with fishing nets and we saw them catch buckets of fish and also some squid which was really cool. We got to hang out, take a team photo, and reflect on how well we had worked as a team that day. It was incredible how a group of 17 people from so many different backgrounds came together to serve the people in Cite Soleil so well. God truly brought each of us here for a purpose and it was great to watch everyone fulfill it today.